This ladies' Irish sweatshirt features a 1/4" contrasting white neck tape and the 2" rolled forward shoulders offer a missy contoured silhouette. The pullover Irish sweatshirt is enhanced by the triple needle stitching on the neck along with the shoulders and waistband. This Kelly green women's Irish sweatshirt is embroidered pullover with Celtic knots along with the Claddagh and shamrocks. This cozy crewneck Irish sweatshirt is pared down for a feminine look and a features 75/25 cotton and poly blend. 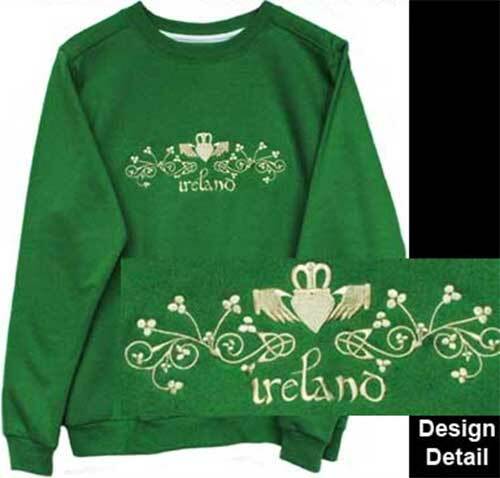 The Irish sweatshirt for women is embroidered in the United States and it is received with the Claddagh legend card along with shamrock and Celtic knot history cards, complements of The Irish Gift House.